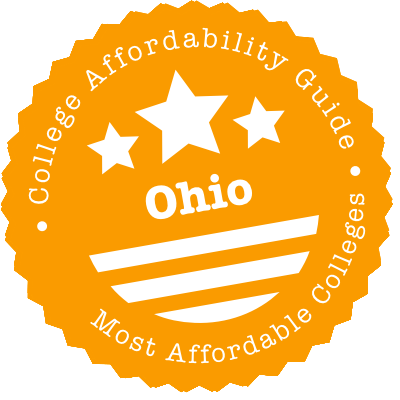 Scroll down to see our top-ranked colleges in Ohio, loans and scholarships for Ohio students, and advice on how to save money going to college in Ohio. Denison University was recently listed among the top 30 small, private baccalaureate liberal arts colleges in a ranking by The Wall Street Journal. Denison, with 53 majors and five pre-professional programs, is building a career exploration center, funding internships, and taking other steps to help students reach their career goals. With an enrollment of 2,250, Denison awards about $60 million in need-based financial aid and merit scholarships each year, enabling about half of students to complete their degree with no debt at all. Even students who do borrow money for college take on less debt than the national average. About 20 percent of Denison students represent the first generation in their family to attend college. With an average yearly enrollment of just over 1,000 students, the Mount Carmel College of Nursing is one of Ohio's largest baccalaureate nursing programs. Incoming freshmen with excellent academic histories are automatically considered for the Presidential Scholarship. This program awards $3,000/year for the freshman and sophomore years, and $4,000/year for the junior and senior years. The College Scholars program offers $2,000/year for the freshman and sophomore years, and $3,000/year for the junior and senior years. The Eleanor Wilson Recruitment Scholarship ($1,200) is offered to qualified students only during their freshman year. Continuing and transfer students are considered for the Eleanor Wilson Academic Scholarship, which awards $1,000 for the sophomore year, $1,250 for the junior year, and $1,500 for the senior year. Walsh University won the Noel-Levitz Retention Excellence Award in 2017, perhaps because it handed out $30 million in grants and scholarships in 2016. After financial aid, the average price for tuition, fees, and room and board for residential students was $16,500 in 2017. Although it's a private university, Walsh's rates are below those of the state's best-known public universities. Plus, students who move on to a graduate degree at the school get a 25 percent discount. Other graduate discounts include the Counseling and Human Development Program Premier Scholarship and the Licensure Program Discount - that's for baccalaureate-holders who need additional undergraduate credits toward the Teacher Preparation Program. Is it possible to have a quality college education for a low cost in Ohio? You bet. Both public universities (e.g. CSU, OU, SSU) and small private colleges are making an effort to accommodate low-income students. After you’ve browsed our profiles of affordable Ohio schools, check out your state financial aid options. Ohio doesn’t have a ton of state scholarships and grants, but it’s always worthwhile applying. You may find you’re eligible for packages (e.g. Forever Buckeyes, Choose Ohio First) that you never knew existed. Looking to make your Ohio college degree that much cheaper? Spend a few minutes on the Students section of the Ohio Department of Higher Education website. Along with detailed info on state scholarships and grants, you’ll find advice on planning for college, financial aid resources, tips on transferring credits and links to Ohio internship opportunities. You also can explore the interactive map of Ohio public institution locations and use the net price calculators to determine the actual price (out-of-pocket college costs minus scholarships and grants) for individual Ohio colleges and universities. Trying to decide between affordable schools? Although it’s targeted at international students, the Ohio G.R.E.A.T. website has a free tool you might want to try. With Explore Schools, you can search by tuition rates, setting (e.g. city vs. suburb vs. rural), degree type and control (public vs. private). Each college profile has a handy summary of in-state & out-of-state tuition, enrollment numbers and the average financial aid package. We also recommend a quick visit to the Ohio Department of Education’s section on Ohio Resources for College and Career Planning. This has a rundown of many student-focused initiatives—including the College Advantage Savings Plan, the College 101 Magazine and OhioMeansJobs K-12—and lots of financial aid advice for parents. When in doubt, call the the OhioHigherEd College Access Information Hotline at 1-800-AFFORD-IT (233-6734) to learn more about other funding opportunities. Summary: The OCOG is one of the best-known state-funded programs. It gives grant money for college tuition to Ohio residents with the greatest financial need. OCOG recipients can use the grant for full-time or part-time study at Ohio public universities, Ohio private, non-profit colleges/universities and some Ohio private, for-profit institutions. Students at community colleges and university regional branch campuses have a $0 OCOG award amount unless the student attends an eligible institution year-round (see the Ohio Higher Ed website for details). In 2016, the maximum annual award was $2,592 for full-time study at a private school. Eligibility: Grants are need-based—your family’s total income cannot exceed $75,000 and the Expected Family Contribution (EFC) has to be equal to or less than 2190. How to Apply: File your FAFSA as soon as you can. The state will use that information to determine if you’re eligible for a grant. Summary: COF scholarship programs are intended to encourage more students to pursue science, technology, engineering and mathematics (STEM) fields in Ohio colleges/universities. A large number of Ohio schools offer COF scholarships, including Ohio University and Cleveland State. For example, the University of Akron gives COF scholars $5,200 per academic year for a maximum of four years. Eligibility: Check with the individual college or university for details on COF eligibility. Along with enrollment in a STEM degree program, you may be required to participate in research projects or extracurricular activities. How to Apply: Apply through your college or university. Each school will have a COF website page with details on the program. Summary: The JRJ program is aimed at Ohio state and federal public defenders and state prosecutors. It provides assistance with loan repayments if attorneys agree to remain employed as public defenders and prosecutors for at least three years. Federal student loans (FFEL and Direct loans) are eligible for repayment, but loans in default, Parent PLUS loans, and private, commercial or alternative student loans are not. Prosecutors who are employees of the federal government and attorneys in private practice (even if they are providing public defense services under contract to the state) are not eligible. How to Apply: Complete the JRJ Application on the Ohio Higher Ed website. Summary: NEALP provides financial assistance to Ohio students enrolled for at least half-time study (or accepted for enrollment) in an approved Ohio nurse education program. This program is open to nurses who intend to serve as instructors as well as students who intend to serve as nurses after graduation. Successful applicants receive a forgivable loan of $1,500 per year—these funds can be used for educational expenses (e.g. tuition, laboratory fees, books, supplies, room and board, transportation and other miscellaneous expenses). To qualify to have these loans cancelled, a NEALP recipient must then be employed full-time as an LPN, RN or nurse instructor in the State of Ohio for a minimum of five years after graduation. If you don’t complete the service obligation, the amount that is not cancelled is owed plus interest. How to Apply: File your FAFSA and then create a NEALP Web Account and complete the NEALP application. ONG Members with an enlistment of six or more years can receive a lifetime maximum of 96 Educational Units (12 full-time quarters or 8 full-time semesters). Active-duty Prior-Service ONG Members with an enlistment of three or more years, but less than six years, can receive a maximum of 48 units (6 full-time quarters or 4 full-time semesters). Non-Prior Service ONG Members in an active 3-year enlistment (includes Active Guard/Reserve) can receive a maximum of 48 Educational Units (6 full-time quarters or 4 full-time semesters). Former ONG Members who have completed their ONG enlistment obligation with an honorable discharge may continue their Scholarship Program benefit for the time they were unable to attend school due to deployment. Eligibility: You must be an active ONG Member or former ONG Member whose education was delayed due to deployment. The ONGSP is available for undergraduate degree programs only; ONG Members who possess a bachelor’s degree are not eligible. How to Apply: Active ONG Members should visit the Ohio National Guard Scholarship website, complete their profile and fill out the application form. Former ONG Members will need complete a separate application. Summary: Intended for Ohio residents, this fund provides tuition money to the children and spouses of peace officers, fire fighters and certain other safety officers who have been killed in the line-of-duty anywhere in the U.S. Funds are also available for the children and spouses of members of the U.S. Armed Forces who have been killed in the line of duty during Operation Enduring Freedom, Operation Iraqi Freedom or a designated combat zone. However, children are only eligible for this program if they are not eligible for the Ohio War Orphans Scholarship. It’s a very generous program. In 2016, the fund provided tuition benefits that covered 100% of instructional and general fee charges at public colleges and universities and $9,020 per year at private and proprietary post-secondary institutions. Money can be used for part-time or full-time study. Eligibility: You must be an Ohio resident enrolled in full-time or part-time study for an associate or bachelor’s degree at any participating Ohio post-secondary institution. You will also need to provide proof of your spouse or parent’s cause of death. How to Apply: Contact the Ohio Department of Higher Education State Grants and Scholarships Department representative for an application form. Summary: The Ohio War Orphans Scholarship Program gives tuition assistance to the children of deceased or severely disabled Ohio veterans who served in the U.S. Armed Forces during a period of declared war or conflict. Scholarship money can be used for undergraduate tuition and general fees at two- and four-year public institutions or eligible private colleges and universities. In 2016, the state funded 100% of annual tuition and general fees for students at public institutions and $5,667 per year for students attending private institutions. How to Apply: Complete the Ohio War Orphans Scholarship Application on the Ohio Higher Ed website. Contact the Ohio Department of Veterans Services for more advice on education benefits for active service members and Ohio veterans. Summary: Forever Buckeyes ensures that any Ohio high school graduate (public or private) who has left the state but returned to enroll in an undergraduate or graduate program at an Ohio college only has to pay the in-state resident tuition rate. In other words, you don’t have to live in Ohio for 12 months prior to enrollment to prove your residency. Every state institution within the University System of Ohio, including four-year public institutions, branch campuses, Ohio community colleges and Ohio technical colleges participates in the program. Eligibility: You must have earned a high school diploma from an Ohio high school (public or private). Unfortunately, the program does not cover students who received a GED. How to Apply: Check with your college or university. You may be required to fill out a Forever Buckeye Residency Application and provide supporting documents (e.g. high school transcript).